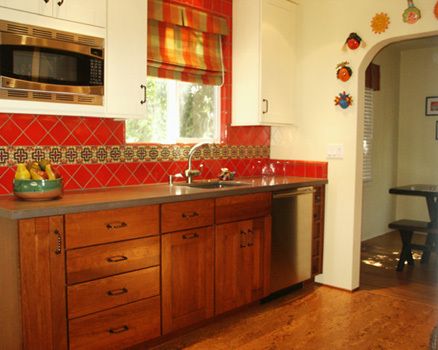 This 1940s Spanish bungalow kitchen remodel combines both kitchen and laundry rooms. New upper cabinets in a painted finish make the small space feel larger, while base cabinets in a rich wood stain offer a warm and cozy feeling. The countertop is Caesarstone with a Spanish tile backsplash. The flooring is cork for a warm and softer feeling that is also environmentally friendly. The archway to the dining room was enlarged from 30 inches to 48 inches for a continuous flow. The dining room walls were painted the same light yellow as the kitchen, and the window treatment is carried across to make a warm and colorful space to enjoy with family and friends.